What is the Missouri Book Challenge? Basically…competitive reading. That’s right. Libraries around Missouri are competing to outread each other. Library staff members read (or listen to audiobooks) and post what they read on this blog. We then turn in our stats each month to the Missouri Book Challenge. The Missouri Book Challenge runs September through August each year and the winners get to have the traveling trophy and bragging rights. MRRL River Readers are the current champs! You can read or listen to any type of book except picture books. You must read the books during the month of the challenge. Books owned by MRRL are preferred – if you review a book that we don’t own, please talk to a selector about adding it to our collection. You can review Mobius books, just link to the Mobius catalog. Write at least one review a month. One review will be randomly selected from all those posted each month. 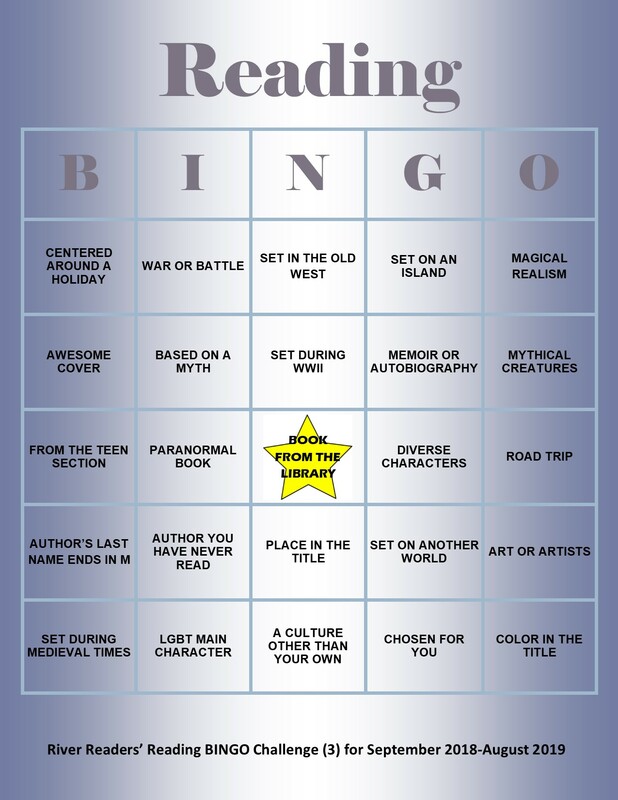 You can also get prizes by doing the Reading BINGO challenges. Every year the Missouri Book Challenge sets state-wide wildcard challenges. Libraries get extra points in scoring for these challenges. Books with a color in the title. Books whose author's LAST name ends with the letter "M"
Team members born in odd numbered years. We have four different bingo cards for our Reading BINGO Challenge. You get a prize every time you get a bingo on your card. BINGOs can be horizontal, vertical, diagonal, four corners and blackout (full card). As a prize you get a free book and a $2 off coupon. Read and Enjoy!